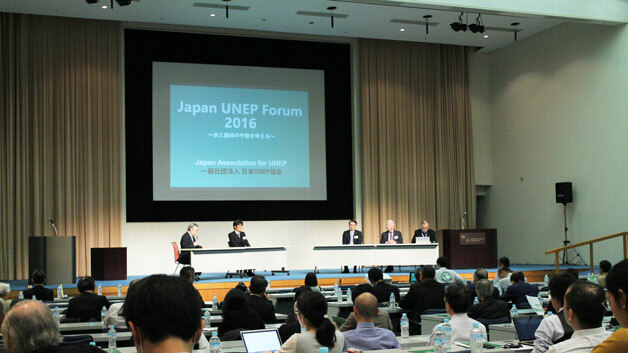 On 22 November 2016, UNU-IAS co-organized the Japan UNEP Forum 2016: The Future of Forests and Water, together with the Japan Association for the United Nations Environment Programme (UNEP). The forum aimed to provide leadership and encourage partnerships between private sector and civil society actors in caring for the environment. In his opening remarks, Taikan Oki (Senior Vice-Rector, UNU) highlighted the central role of UNU as a bridge that connects Japan and the international community, playing an important role in achieving the Sustainable Development Goals (SDGs). In a video message, Alexander Juras (Chief, Civil Society Unit, UNEP) addressed the particular importance of Goal 17, and stressed that to achieve the SDGs, partnerships between various types of organizations including NGOs were necessary. In the first keynote speech, Motoyuki Suzuki (Representative Director, Japan UNEP Association), emphasized the relationship between water and human activities. In terms of integrating the SDGs into policymaking, he addressed the importance of global responsibility and considering the SDGs from a broader perspective. The second keynote speech, given by Kazuhiko Takeuchi (Senior Visiting Professor, UNU-IAS), focused on the harmonious coexistence of humans and nature. He explained the contributions of the International Satoyama Initiative towards achieving this by connecting global and domestic activities. He highlighted the importance of the connections between nature and humanity, and suggested that mori (forests), kawa (rivers), sato (land), and umi (seas) serve as common ground. A panel discussion focused on actions by the private sector for achieving the SDGs. The panelists addressed the importance of the SDGs in companies’ long-term strategies, and acknowledged that various initiatives involving the private sector, including the UN Global Compact, were already starting to take shape. The panelists shared the view that investors are also starting to look to such initiatives to help them to avoid risks.